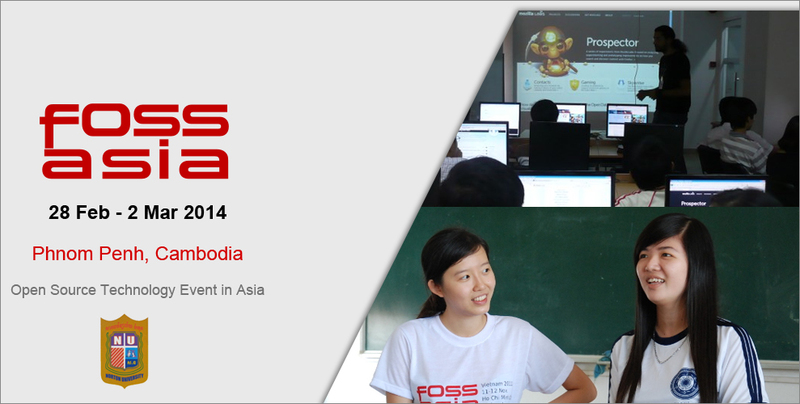 Fossasia is a free software community in Asia, whom first meetup took place in 2009 in Ho Chi Minh City. Since then, the community has organized conferences in Vietnam focused on Free and Open Source Software. So far, former Fossasia’s events have attracted over 1400 participants and speakers from 24 countries. What about Fossasia 2014 ? The 2014 edition will take place in Cambodia, for the very first time, at Norton University. From february 28th to March 2nd, the event will feature conferences and lectures related to Free and Open Source Software, Mobile Solutions, Web Technologies, Linux Operating Systems, Open Education and Open Map solutions. A special focus will be « the use of open technologies in sustainable development in order to improve the lives and conditions of those living in poverty ». This Open Technology event is tailored for developers, students, and startups, especially the ones already using or willing to use open source softwares. This event is « a unique opportunity to share the latest innovations in open source technologies and meet contributors and potential partners ». As Fossasia « works together with Open Source projects in Asia and around the world and develops Free and Open Source software for social change », this event will be more than exciting for Cambodia’s tech and Startup scene, and we hope to see many of our readers attending ! To proceed with registration follow the link here.